Summer’s sunny days call out for iced puddings and it’s easy to make a tangy sorbet or velvety ice-cream with ingredients that don’t cost much. 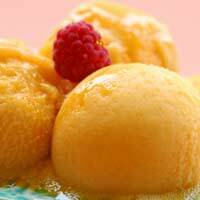 A sorbet has two flavours: sweetness and acidity. Acidity is the flavour that makes our tongues tingle, so getting the balance between the two is important – it’s also fun, because the way to find out if the balance is right is to taste your sorbet mixture over and over again, remembering that it gets sweeter as it freezes, so you want to stop adding sugar while it’s still a little more acid than you like. Star anise is a Chinese spice, shaped like a wooden flower, which adds a lovely extra taste to the sorbet, but if you don’t have star anise, don’t worry, you can use three cloves instead. Pour the orange juice into a medium-sized saucepan with the star anise or cloves and measure out around 75 grams of the sugar to add to the pan. Keep the other 25 grams to one side to add when you have carried out your taste test. Bring the mixture to a boil, stirring gently with a wooden spoon and then remove the spices using a spoon to fish them out. Allow the mixture to cool to lukewarm and taste it. If it seems sweet enough, proceed but if you think it’s really too sour, pour it back into the pan and reheat it with the remaining 25 grams of sugar. Cool again and then pour into a freezer-safe plastic container with a lid. Freeze for an hour, then take it out and use a fork or small hand-whisk to break up any ice crystals around the edges. Repeat the process an hour later and then for the third time an hour after that. Leave it to freeze overnight and then eat it! If you’ve never tried brown bread ice-cream, you’ll be surprised how delicious it is and it’s really simple to make. Using a large baking tray, spread the crumbs out evenly over its surface and toast it under a medium grill. As soon as the crumbs start to change colour, take the tray out, and stir them around, replacing them under the grill so that they brown evenly. Set the tray aside to cool. Pour the cream into a large jug or glass bowl and pour into it the cooled crumbs, leaving for an hour in the fridge to let the crumbs swell in the cream. Then add the sugar, maple syrup and vanilla, mixing everything together with a fork. If you have an ice-cream machine, churn until the mixture has a whipped cream consistency. If not, use a freezer-safe plastic container, a large baking dish, or a plastic or stainless steel bowl and pour the mixture into it before placing it in the freezer. After 45 minutes, take the bowl out of the freezer and thoroughly stir it with a spatula or whisk, scraping down all the edges of the ice-cream and breaking them up so that the ice crystals are reduced in size. Keep repeating this process every 30 minutes – it normally takes around two and a half to three hours to freeze into cream. The last time you mix it up, use a spatula to help tip it into freezer-safe containers if you’ve been using a bowl, and cover them with a layer of greaseproof paper before putting the lid on and freezing. This ice-cream can be served an hour later, but if you want to keep it longer, you need to remember to take it out of the freezer and put it in the fridge 30 minutes before you want to serve it. This is the simplest ever recipe, and is great to make if you’ve been picking your own strawberries. The riper the strawberries, the easier it is to make the ice-cream. Take out the hulls (the green leafy bits) from the berries and ask an adult to cut them in half or to supervise you as you do it. Then put them in a flat-bottomed container and use a potato masher or a fork to squash the strawberries so that they become a mushy liquid with some lumps in. Now tip in the mascarpone and mash it with the strawberries, it doesn’t have to be perfectly smooth – in fact it’s better if it’s not. Then pour in the condensed milk and stir it all together with a spatula or big spoon. Stop stirring when the mixture is still streaky before pouring it into a bowl or box and using the method described above to break up the ice crystals.